We’ve been waiting the better part of a decade for SSD prices to drop and they have dropped somewhat. Often you find yourself a little cash strapped and can’t afford one of those infernally expensive PCI-E drives where you sign a contract to send your left arm in exchange for the drive. Hardware RAID is usually just out of reach of the average consumer and while hardware RAID cards are great they soon become outdated and an expensive paperweight. We got together with the good folks over at VisionTek and they were kind enough to send us a second VisionTek Go Drive. You can peek at the VisionTek Single Drive Review but we’ll be recreating some of it here so you don’t have to jump back and forth. We’ll be using 2 x Visiontek Go Drives both 240GB drives (model 900512) on an Asus X99 PRO motherboard using the built-in Intel Rapid Storage Technology. Intels fancy words for RAID. We are using two drives and chipset limitations on most X99 boards are 6 drives in any RAID configuration. We’ve messed with RAID enough that we can tell you any combination of drives whose speed is about 1500MB/s is about all you want to use. Three 500MB/s drives top out the bandwidth on built-in RAID. 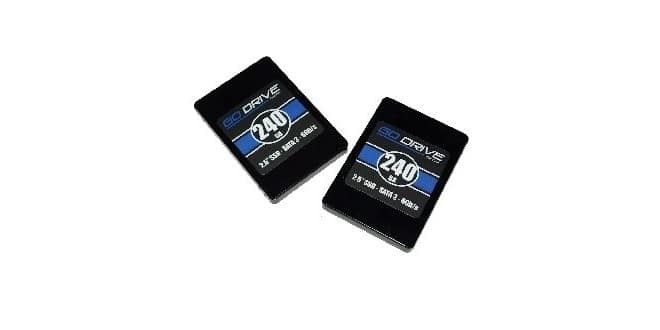 We’ll be using two of these drives in out RAID 0 Array and we know no picture no proof is the law of the land so here’s both drives in one shot. SandForce isn’t the newest controller on the market but with the real limitation on SSD’s being the aging Sata 6Gb/s controller is what is holding Sata SSD’s back. Sata 6Gb/s SSD’s can easily saturate the bandwidth provided by their motherboard Sata port. Sata 6Gb/s theoretical bandwidth is in the 600 MB/s range with realistic sustained transfers of between 550 and 560 MB/s depending on compress-ability of data. We’ll be taking a look at compress-able and in-compressible data a little later. The SandForce controller on the VisionTek Go Drive is fully capable of hitting 550MB/s given compressible data and that’s the standard all SSD manufacturers give you on rated speed. 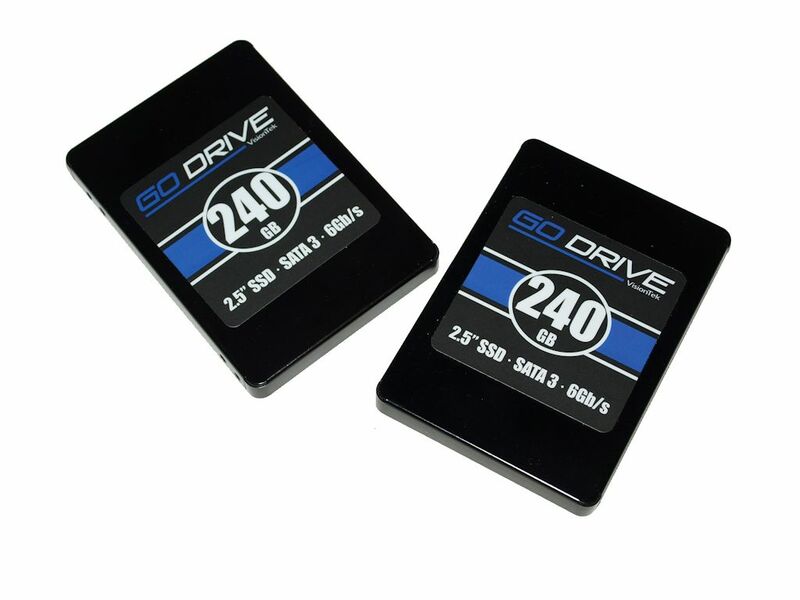 However what makes the VisionTek Go Drives shine in the current pack of SSD’s is the hidden technology. Trim appeared shortly after the first SSD’s hit the market and is in a nutshell a utility that lets the SSD know which 4k blocks of Nand flash are no longer in use. In order for an SSD to write to a single block without having to do more than a simple write the entire page has to be empty. Otherwise the block has to be copied to the cache, the blocks in the page that need deleted are deleted the page is modified then written back to the SSD in it’s modified form. The Trim command marks blocks that are deleted by the OS or user as no longer containing Valid Data and can therefore be overwritten without the copy to cache delete, insert the new data and rewrite the entire page. SandForce gave the name DuraClass Technology to the overall technology used in its controllers. SandForce bypasses Dram caching reducing complexity and cost when compared to other SSD controllers. SandForce controllers use a proprietary compression system to minimize the actual amount of data being written to the Nand flash cells. It’s this proprietary compression system that limits the amount of data being written to the NandFlash that helps with the longevity of the drive and that portion of the technology is known as DuraWrite. Reduce the use of the Nand Flash by compression you extend the life of the Flash. Intelligent Block Management and Wear Leveling is a fancy way of saying that the SandForce Controller distributes data evenly across the Nand flash so that each cell is used as much as any other Nand Flash Page. Since each page is used uniformly no particular set of cells gets more use so the lifetime of the drive is extended by using all the cells equally. Pretty simple concept but it took a while for SSD manufacturers to incorporate it into the designs. Garbage Collection is nothing more than the SSD going through the data and stacking good valid data neatly in pages marking the swiss cheesed pages for deletion when the system is idle. Since the block is pre-erased it can be written to directly and incurs no slow down by shifting data to cache blanking the page then writing the data to the freshly blanked page. Redundant Array of Independent Silicon Elements (R.A.I.S.E) is a complementary technology to the Error Correcting Code (ECC) capabilities of the Flash Storage Processor (FSP) found in the LSI SandForce DuraClass™ technology component. What raise does is provide error correction for naturally occurring errors during Nand Flash operation. Redundant information is stored in multiple cells and re-assembled in the unlikely case of an unrecoverable data error and provides the best in class ECC rate. Power/Performance balancing is just technology that allows the VisionTek Go Drive to use the power it needs without wasting power making the drives more attractive to mobile implementations. 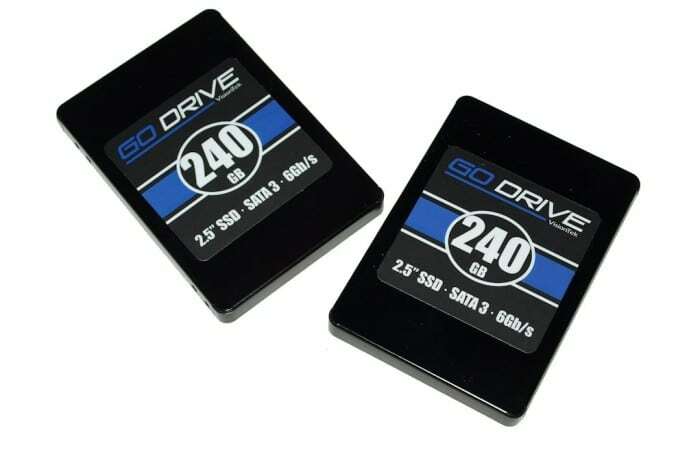 VisionTek's 240GB Go Drives in RAID 0 help beat the SATA 6 speed limit of 600MB/s and lets you spread your storage investment across two purchases.